Lucy has left Danfield, New York and moved to Hollywood to be closer to her daughter Chris. It is also explained that Vivian has re-married and remains back in Danfield. Lucy transfers her trust fund to the Westland Bank in Hollywood and runs into her former co-hort. By great coincidence, Mr. Mooney has been transferred to Hollywood and is once again the trustee for her money. Lucy's daughter Chris is in college (explaining her absence) and her son Jerry is being enrolled in a military academy. Unfortunately, the school is going to Marineland for Jimmy Piersall Day and Jerry can't go because he is not yet an official student, so Lucy talks Mr. Mooney into taking her and Jerry anyway. They meet Jerry's favorite baseball player, Jimmy Piersall, and he signs a baseball just for him. Lucy accidentally throws Jerry's autographed baseball into a pool. To get it back, she ends up in the water with the porpoises and seals. Special Notes: A new opening, featuring a kaleidoscope of The Lucy Show scenes from previous seasons, is used this year. If you watch, you'll see Lucille's mother, DeDe Ball along with her children, Lucie and Desi Jr. in the Bleachers at Marineland behind Lucille. 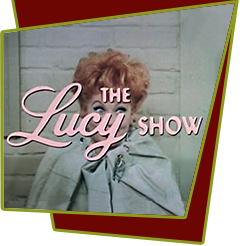 This is the first "Lucy Show" episode that aired in color, although Desilu had been filming the series in color since the start of season two.